Joan Wells brings an educational and entertaining experience to your community with her Trick and Fancy Roping. This type of Wild West performance art became a part of American heritage 100 years ago. 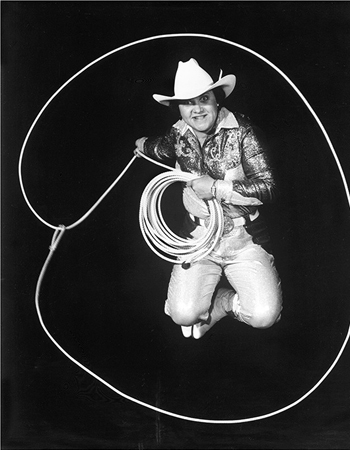 Joan won the title of Women's World Champion Trick Roper in 1979, then in 1989 was inducted into the National Cowgirl Hall of Fame in Fort Worth, Texas. This program includes a fast-moving 35-minute presentation with narrative and is choreographed to contemporary western music. Technical requirements: Access to an electrical outlet for the artist's PA system. Floor space of 15' x 15'.